Hal Jordan and the Green Lantern Corps 36 sees the conclusion of the “Twilight of the Guardians” storyline, as our favorite Earth Lanterns rescue Ganthet and pals from the Controllers. Unlike previous issues, Robert Venditti frames this issue from Ganthet’s perspective. In the face of his own death via Controller transformation, Ganthet laments on the very long life he’s lived. Most of all he laments on the fact that he has never been a father. The bulk of the issue is the Green Lanterns battle against the Controllers. 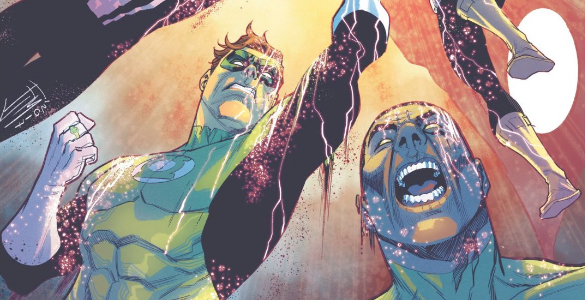 It’s clear to me that Venditti has the most fun when he is writing all four Earth Lanterns working together. Likewise, it’s a lot of fun to watch. One of the best parts of seeing these four in action is how an artist portrays their various styles and constructs. Jack Herbert draws Guy Gardner viciously slamming the door of a pick-up truck on a Controller’s head. Kyle Rayner’s constructs are the comic book/manga mechs that only his imagination would think of. John Stewart is an architect and a sharpshooter, so his ring makes both detailed excavators and allows him to make the final shot that frees the Guardians. And while Hal Jordan might be “the greatest Green Lantern”, he certainly isn’t the most inventive. A couple of missiles or a giant hand is Hal’s M.O. Ganthet watches as all of his Lanterns do their work, proud as if they were his own children. He never says it explicitly, and the implication is stronger because of it. The issue ends with Ganthet making a proposition to the remaining Guardians — the last of their kind. Instead of a plan to repopulate their race, he simply gives the old blue guys their old red robes back. The more things change, the more they stay the same.